Talk to him to start the quest. He will tell you to observe other knights training. Then go outside of the Knight's Guide, look for some knights training at the garden between the Prontera Castle and Knight's Guide. Outside of the Knight's Guide. 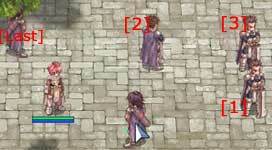 At the space between the Prontera Castle and Knight's Guide. The NPC is invisible, you can look for the chat bubble on the ground. But you should trigger the auto NPC popup window if you step on its 5x5 tiles (or larger) effective area. Then talk to Grand Master who is next to the invisible NPC chat bubble. After that, go back into the Knight's Guide to talk to Essofeit. Then go outside again and talk to the knight next to the tree (prontera,66,358), Gatack (He look the same as Grand Master). Gatack should mention about 5 Candy Canes and 3 witherless roses. These are the items you need to find and give to Essofeit to get the skill. Talk to him and he will take those items off you. Talk to him again and he will teach you the skill. You can buy the Witherless Rose from a Trader near the East exit of Morroc.